An afternoon of baking: I wanted my cake, and to eat it too! Years ago I took a friend to tea at a cute restaurant about an hour’s drive from our house. The restaurant is on a working farm, they call it a living history farm, and is in a quaint, old farmhouse. The kind of place you might see a grandma knitting a blanket in her rocker on the front porch. They serve a traditional afternoon tea, with finger sandwiches, scones and clotted cream and lemon curd, the whole nine yards. It was such a lovely sunny afternoon the day I took my friend there for her birthday tea. She was nine months pregnant with her second daughter. That baby will turn 21 next month. I visited the farm a number of times after that, once for an Alice in Wonderland themed tea with my boys, and then there was the time we visited as a family and took a tour of the farm and the boys were thrilled with the tractors and the farm animals and we purchased plant starts and then brought them home and planted them in our own garden. The boys used to help me plant and weed and harvest our garden. Their favorite were the potatoes because it was like a treasure hunt. Each year the farm owners throw a large, old fashioned Independence Day party with hay rides, and pie and home made ice cream, sing-a-longs, and square dancing. I signed up for the farm/tea house newsletter and it was so long ago, the newsletter was an actual paper newsletter they sent in the mail. Each edition included upcoming themed teas and activities going on in and around the farm and restaurant, as well as news from back home (the owners are from England), fun new English imports you could purchase in their gift shop, and a single coveted recipe from their kitchens. I used to tear the recipes out of the newsletter and keep them tucked away in my old recipe holder my mother gave me. Now, it seems, I go straight to the internet to get a lot of my recipes. I would like to go back to using my old fashioned cookbooks. The farm’s newsletter also went electronic, and now they even have a blog. I miss the old paper newsletter I received in the snail mail. It was unique. I haven’t been out to this farm in quite some time as it is a drive, and also, we belong to a CSA farm share closer to home. CSA being an acronym for Community Supported Agriculture and each week (approximately 28 weeks of the year) we drive out to the farm and pick up a basket of vegetables. This week we scored two beautiful heads of lettuce, beets, new potatoes, fennel, radish, kohlrabi, sugar snap peas, scallions, kale, chard, Chinese broccoli, spinach, two heads of garlic, and a dozen farm fresh eggs. Each week I have the challenge adventure of creating recipes for all these wonderful vegetables. One of my brothers is in town, and last night’s dinner was chicken stir fry and included sugar snap peas, scallions, Chinese broccoli, and garlic (plus mushrooms and red peppers from the local market). And that is all good and fine and makes me feel healthy and all, but for a couple days now, I have been craving cake, specifically white cake with white frosting. Sometimes I crave things and until I have even just a little bit of what I am craving, I will obsess on it. A couple nights ago we were watching a season three episode of the Mindy Project and she ends up basically burying her face in a huge birthday cake. The cake looked like one of those big ones from Costco, white cake, white frosting and a bunch of decorations on top. I have been craving that cake ever since. Well, I am not going to go to a bakery and purchase a big old sugary cake just for myself and the regular grocery store cakes, cupcakes, etc… are filled with junk, preservatives, even food coloring (they are WHITE for Pete’s sake). I decided it best that I not have any cake at all, for obvious reasons. But, really, I could not stop thinking about it so I used the excuse of my brother being in town to make a beautiful bundt cake (bundt cakes will always and forever remind me of ‘My Big Fat Greek Wedding’). One of my favorite recipes from the living history farm, is the one for Lemon Blueberry Sour Cream Cake with Lemon Glaze. It is a decadent recipe for sure. I’m not going to sugar coat this, the recipe has a boat load of sugar and fat and the cake is amazing tasting. It’s a treat and anyone who loves sweet lemon and or blueberry desserts is sure to love it. It is dense and rich and I made this cake yesterday for last night’s dessert. I didn’t think about it, or I could have taken a better photo of the entire bundt cake. I have posted this recipe on another blog and had commenters say they were able to convert it to dairy free and it still tasted amazing. I am sure you could use an alternate flour and make it gluten free as well. I make it just as it is and enjoy one slice and leave the rest for the boys that work off their calories with more diligent exercise. My son and his friends love this cake. When the boys are around the whole cake doesn’t last a day. Preheat oven to 350. Grease and flour a large tube or bundt pan. In a medium bowl sift: 3 cups flour, 1/4 teaspoon baking soda, 1/2 teaspoon salt. Cream in a large mixing bowl: 1 cup softened butter. Add 2 Tablespoons lemon juice and grated lemon peel to butter mixture. Gradually add sugar to butter mixture. Beat two minutes. Add 6 eggs, two at a time mixing thoroughly after each addition and two or three minutes after all the eggs have been added. Add half the flour mixture to the butter mixture on lowest speed until blended. Add 1 cup sour cream and the rest of the flour mixture and mix until smooth. Fold in 2 cups blueberries. Pour batter into prepared pan and smooth top. Bake for 60-80 minutes or until tests done. Cool 20 minutes in the pan, then turn out onto a cooling rack. After cake is completely cool, mix 2 cups confectioner’s sugar and 1/2 cup lemon juice to form a smooth mixture. Drizzle over top of cake to glaze. Note: I make half the glaze as most just puddles around the bottom of the bundt and the cake is sweet enough as it is. I have made this cake for pot lucks and also Fourth of July parties because I tend to like cake, on most days, a little more than I like pie. Thanks!?!?! I believe this kind of thing includes answering questions about myself. I’m an expert at that… I’ll get right on it ;). Also, I have the distinct feeling that you are not the only person I annoy! 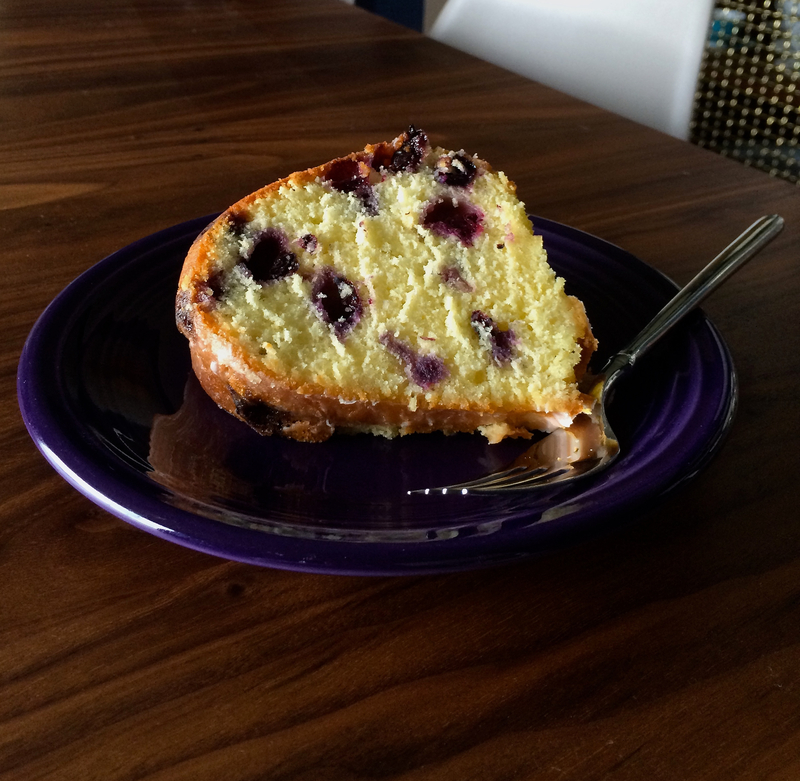 Oh God, I LOVE blueberry sour cream cake! (And NH, I am a lemonaholic! Gimme, gimme, gimme, I guess that is the opposite of chocaholic – I don’t really go mad for chocolate. Really good quality chocolate is lovely, but I don’t really like chocolate flavoured things, like cake, milkshakes, etc) This looks amazing, but I am being very intense in my weight journey at present, and will hold off for an “occasion” to bake one. I agree entirely Kat, you have to allow treats from time to time, or you go mad! You just have to know how often “time to time” is, lol, and I think you do. I eat real food, no additives, and close to a paleo type of thing. There is very little added sugar in my diet, so a splurge on cake (or booze!) is always quite special, I have a sweet tooth that I try to keep satisfied with fruit. Lucky in that we have grassfed home killed meat, and I usually have a good veggie garden – is a bit neglected at present for the winter, but I will get stuck in when I finish the semester in the next week or two. I always buy the best welfare and quality I can afford. Small portions of protein, and lots of greens. I have another recipe that has less sugar, but the texture of yours looks incredible, all cakey (go figure!) and … just delicious looking. We have such a short blueberry season here, I like to eat the fruit fresh, so I usually use frozen in mine, I always keep organic bags in the freezer, I like eating them frozen like little fruit lollies (candy.) Sprinkled on porridge and in breakfast smoothies. Oh, and I would NEED a big dollop of fresh, softly whipped organic cream on this – that is my downfall, wait, actually my downfall is a much longer list! So yes, a day and a half later, there is half the cake left and Sammy is asking for whipped cream. We have whipping cream in the fridge, he has just never whipped it himself, so leave it to Mommy to do that. I do want that cake to disappear though, so whipped cream it is. I took a double take when I saw the sugar in that baby (I actually put a little more than two cups in this one). Awareness is really important in coming up with a permanent healthy eating plan. Knowing what is in our food is crucial. No more cake for me for a while (at least making it myself I knew I was using some pretty nice ingredients even if they hold very little nutritional value), but that is okay because my craving is gone now. Living on a farm must provide some of the loveliest foods. We feel so lucky to have so many organic farms around us. Driving out to our CSA farm to get our fresh veggies is a real treat. We also volunteer at the farm a couple times a season. Nothing like being out there at 7:00am in the crisp air picking veggies. That looks and sounds decadent! Holy sugar though!!! I bet it could easily be reduced. I think I’ve mentioned before but I love cooking and baking… I love my kitchen and my gadgets and have a bookshelf dedicated to cookbooks.. You cold even say I hoard them. I’ve read them cover to cover like a novel. I’ve restrained myself the past few years from buying any new cookbooks, but I do love them so! I even bought myself a graduation gift …a series of seasonal cookbooks that are first edition and autographed years ago, when I graduated college. They are one of my coveted possessions. I have some kind of addiction for recipies… My Pinterest will prove it! And your farmers co-op sounds fabulous! I can’t wait for the local farmers markets to have fresh produce.. Here in Maine it takes a while.. I’m just planting my veggies this weekend… Tomatoes, squash, zucchini, cucumbers, peas… Some herbs.. Yesterday I made two loaves of bread. Yeast breads have been my most recent passion/obsession! I probably should have been a farmers wife! I totally appreciate and understand your love for cookbooks and cooking. Yes, my Pinterest boards are insane with recipes. I have so many boards and pins it should surely be called an obsession! You live in Maine? I absolutely love Maine. Our younger was at Bates College until he decided to come back home. Our oldest looked at Bowdoin, twice. Once before he got in and once after. He decided to go elsewhere (I was so sad). We spent a week one Autumn in Bridgton, Maine on a pond as a family. One of the best vacations ever, your coast is so amazing, so different from the west. We do love our farm CSA. And, there is nothing like the smell of yeast bread baking! Enjoy your veggies. Fresh from your own garden is the best. We have grown asparagus for about 6 years now and they are so amazing straight from the yard, so crisp and sweet. Enjoy summer! Oh how interesting our connection could have been! My nephew was a 2008 Bowdoin Grad. Also, I’m curious as to where in Bridgton.. My parents have a cabin there that I spend as much time as I can thru the summer… Such a small world. I tried and failed growing asparagus! But I love it! Absolutely, Bugs. I love me some Pinterest. 🙂 I’ll send you an email. You’re welcomed to follow me! But I post away in there some days and then leave it for weeks! I’ll follow ya! I just mostly post awesome work educational camp stuff and some stuff to make me happy. Yes, I realize 3 cups of sugar IS a lot, as I mentioned above. It could definitely be cut back, and the glaze could be cut out completely. I added about two cups because we have been reasonably sugar free around here for a while (but I wanted to keep the recipe in tact because I have always (before) made it exactly as it was written). Realistically, that sugar is spread out over about 12-15 portions, but it is still sugar. I figure in the slice I consumed, there was most likely about 27g of sugar. Definitely a splurge for me. I have not abandoned a healthy eating lifestyle for myself. I have discovered that for me, I need to adopt a permanent lifestyle that allows for a treat now and again. It was great getting all those things like sugar, grains, legumes, dairy, etc… out of my body to see how I felt and to better determine what was happening with my sinuses and my stomach problems. We haven’t been on the Whole30 for a while now, but we have adopted many of the “rules” if you will, on a permanent basis, like no preservatives, no chemicals, and no food colorings and no added sugars in the foods we eat daily. We purchase the highest quality grass fed meats, healthy raised poultry and eggs, etc… I limit my grain intake and eat gluten free or just plain grain free a lot of the time. Removing diary didn’t really seem to do much for me, but I have limited it nonetheless. I do like some goat cheese now and again, and I have started actually taking a liquid probiotic, which helps with my tummy a lot. I’m a constant work in progress. I don’t weigh myself as I am really trying to go with how I feel (the doctor weighs me enough!). I do plan on eating Whole30 for periods of time as I like the feeling when I am eating that way, but again, it will probably always be a modified version for periods of time. With me, there is a lot of mind play going on. I know there is no easy answer or short term fix to my long term problem and I do the best I can and try and steer away from my sugar cravings the majority of the time. Ok so I’m not a big tea party person but my girls are! 🙂 Although they do not like lemon cakes.. I want to start throwing tea parties for them. Oh a cake I can eat! Yummy! Thank you so much for sharing. I think I’ll make one tomorrow. I know exactly what u mean about cravings and food obsessions. I will lie awake at night an think about it– I kid you not!!! Cute, C, cute. I would love to have a tea party with you! I am dying to have a tea party. I really am. I so miss doing afternoon tea in London. Yes it sounds n looks really good!